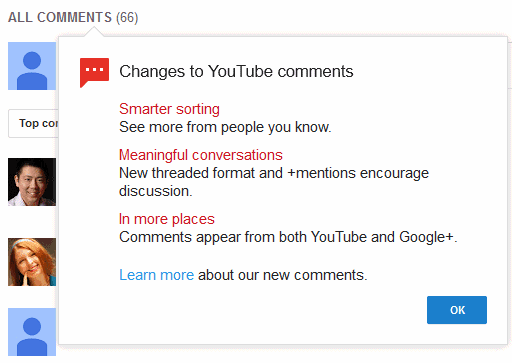 YouTube started to roll out the new commenting system powered by Google+. Meaningful conversations: new threaded format and +mentions encourage discussion. Comments appear from both YouTube and Google+. "Comments you care about show first. You'll see comments at the top of the list from people in your Google+ Circles, from creators, and from popular personalities. Comments with many likes and replies will rank highly as well. Choose Newest First to see the most recent comments instead. Replies are threaded (like Gmail) so you can easily follow conversations. Google+ posts that link to videos or channels will also appear as comments on YouTube, marked 'via Google+'. You can report any comment for spam or abuse. If you're a creator, you can also use comment moderation tools for comments on your videos or your channels," informs Google. "By default, your comment will be public on YouTube. You can also have a more private discussion by sharing your comment just to specific people or Google+ circles. Click Edit to enter the people and circles you want. On mobile apps, tap the field that shows the visibility of your post. You can also share your comment as a post on Google+. Only the people you choose will be able to see the comment on Google+." You can also add rich text using the old Google Talk tricks: *bold*, _italic_, -strikethrough-.